Owatonna, in southeastern Minnesota, is home to an exceptional architectural treasure. The old National Farmer's Bank Building has been called "the most beautiful bank in the world." It is also referred to as a "masterpiece." The bank was built in 1908 by the legendary Chicago Architect, Louis Sullivan. It's one of eight small Midwestern banks that Sullivan designed at end of his career. The Owatonna bank is Sullivan's biggest and most elaborate. As the bank was being built, Sullivan wrote "I want a �Color Symphony' and I am pretty sure I am going to get it." THE STORY OF A BUILDING is a human story about the people and ideas that came together to create something new. The Owatonna Farmer's National Bank Building is the story of two men: Bank President Carl Bennett, and Architect Louis Sullivan. Together they created "a jewel box of the prairie." The bank commands the corner of Broadway and Cedar, across from Owatonna's Central Park. Some visitors make a pilgrimage to see it, coming from Paris and Buenos Aires, from Tokyo and Rome, as well as from across town. "It's a building where if you were to know nothing about architecture and were driving through Owatonna one day, and got to the town square and saw it you would scratch your head and say what in god's name is this doing in this little town, " says Larry Millet, an editor and architectural critic for the Pioneer Press, who wrote a book on the Owatonna bank, called The Curve of the Arch. This is not a typical bank. It's a massive brick cube of a building with two enormous semi-circular arches. The arches contain stained glass windows set into the cube. 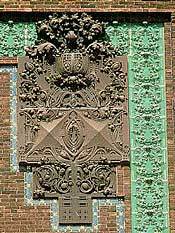 The building is outlined by green and blue tile and terra cotta ornaments. Architectural historian Tom Martinson calls it one of the greatest buildings in American history, because it is unlike anything else before or since. What happened in Owatonna started about 1906. The local banker, Carl Bennett, needed a bigger bank. He could have built the usual kind of building�a Roman temple with fluted columns out front�like banks in a thousand other small towns. But Bennett wanted something different, because he was a different kind of banker. "Carl Bennett was an accomplished musician at Harvard," reveals Dan Freeman, Bennett's grandson. "His passion was music. He was going to stay in New York and become an artist. But his father, my great grandfather, Leonard Loomis Bennett, said, 'I paid for your education and you are going to come back home to Owatonna and help me run this bank.'" Reluctantly, Carl Bennett did what was expected of him as the eldest son; giving up the idea of becoming a conductor or concert pianist. But later as bank president, when it was time to build a new bank, Bennett let his artistic nature flourish. He followed his dream to build�what he called�"a true and lasting working of art." In 1906, Louis Sullivan's architectural career was washed up; he was a nobody; a heavy drinking has-been. He had never even built a bank. But Louis Sullivan had once been a great architect. He is considered to be the father of the first true American skyscraper. Sullivan designed the 10-story Wainwright building in St. Louis in 1891�the first building that looked like a skyscraper, and was built like one, with an all steel skeletal frame. Frank Lloyd Wright had once worked for Sullivan and learned from him. Wright called Sullivan his "master" and "mentor." It was Louis Sullivan who coined the famous phrase, "form ever follows function, and this is the law." His motto: Form follows function - meant many things, but essentially that buildings should grow organically to fulfill their functions, almost like trees. Sullivan talked about the poetry of a building�a symphony of nature, an extension of life itself. He was also one of the first architects to link art and technology. And he sought to create a new American architecture, combining the rational and the emotional -the natural and the industrial - the practical and the spiritual. Close up of a corner cartouche. It is said that "a great architect does his best work for a great client," and Louis Sullivan was lucky that Carl Bennett asked him to design a new bank for downtown Owatonna. Bennett took a risk on Sullivan�possibly because he knew he would not get a conventional bank. He wanted a fresh statement of what a bank could be and knew architecture and Sullivan's celebrated background. Bennett came up with $125,000 to build the bank�an extravagant sum for a small-town bank at the time, the equivalent of about $25 million today. Visitors who go inside the bank compare it to a religious experience, like walking into a cathedral bathed in light. As the bank was being built, Sullivan wrote to Bennett saying "I want a �Color Symphony' and I am pretty sure I am going to get it." A symphony of color it is. Shades of green and amber and brown. In 1926, Carl Bennett, lost his beloved bank when the farm economy collapsed. The Owatonna Farmer's National Bank became insolvent and was closed. The bank changed hands after that. The building suffered some terrible restorations, which were later corrected, though some ornamentation was lost. There are plenty of bland, monumental, and derivative banks dotting the landscape today. Few of them can be said to lift the spirit; or can be described as awe inspiring and breathtaking as Louis Sullivan's Owatonna bank built by the musician-turned-banker Carl Bennett. Together they made good on their individual dreams, creating a work of art, a jewel, with a symphony of color. 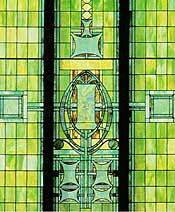 Louis Sullivan's other banks in addition to the one in Owatonna, can be found in Columbus, Wisconsin; Cedar Rapids, Grinnell and Algona, Iowa; West Lafayette, Indiana; and Sidney and Newark, Ohio.